Here' s how it ends: Ed gets married, anyway. Why no spoiler warning? Two reasons: 1) You already know it (and you know that it doesn't matter) within the first three minutes of "Chaos Theory," and 2) "Ed" is an entirely disposable component of the framing device. 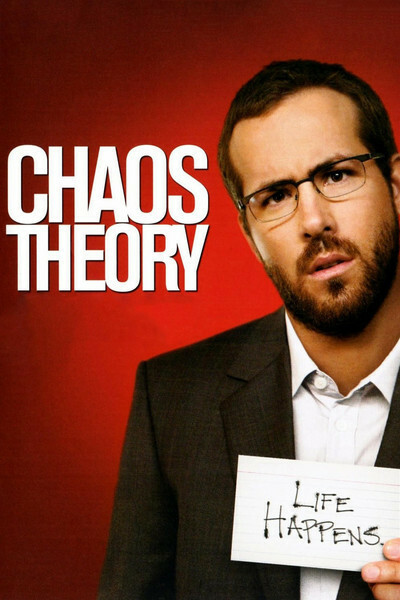 He' s not even really in "Chaos Theory," he's just at either end of it. True, you should never judge a book by its bookends, but if you put the bookends too far apart, they're not going to do much to hold the book up, either. That's Ed for you. You know what they always say about stories. When it comes down to it, there are really only two: somebody goes somewhere (fish out of water), or a stranger arrives (familiar water, unknown fish). "Chaos Theory" is neither, sandwiched between both. Dramatically it's neither fish nor fowl, so you can't quite tell if the sandwich is tuna salad or chicken salad. The thing about the cards is that Frank can't live without them. He uses them to keep himself organized, and to help him make decisions. As is usually the case with husbands and their obsessions, his wife, Susan (Emily Mortimer), is jealous of the passion and time he devotes to them. As if she's the most important thing in the world. Ha! One morning she asks him when he has to leave the house. "Eighteen after," he says (ever punctilious, as if she didn't know). That is not a time, she diagnoses, "It's like a symptom, it's like a twitch." She claims she wants 10 more minutes of his time so that she can get him to run an extra errand before catching his ferry. Instead she ruins their lives. Whether it's truly inadvertent or an expression of subconscious rage is never made clear, but instead of setting the clock ahead 10 minutes (so she can reassure him that he has more time than he thought), Susan has actually set it back 10 minutes, which puts him at negative 20 minutes right at the beginning of a long, long day. This is the kind of passive-aggressive gesture that can trigger years of couples therapy but, frankly, Frank doesn't have time. His world collapses like a precariously assembled dinosaur skeleton. For a while he clings desperately to his old ways, then abruptly switches to a new counter-theory that embraces whim, chance, chaos. The standard misunderstandings and coincidences that such movies rely upon for laughs soon reveal secrets of the past that lead to tears. Buckets of tears. There's so much crying here -- not of the funny kind -- that you may forget you were watching a comedy. Except, of course, that you already know it began, and will inevitably end, on somebody's wedding day. Whenever I see pictures of Ryan Reynolds I fear that he's Dane Cook, but, thank goodness, he is not. He's a likable comedic presence, like a more manicured Jason Lee, and Frank gives him a chance to play one of those pent-up heroes (Cary Grant in "Bringing Up Baby," John Cleese in "Clockwise") who have to fall apart before they can learn to let go. American movies love that process, and the audience finds both phases of these characters' deconstruction innately satisfying to watch. Fortunately for Frank, he's in a comedy, after all, and not a weepy melodrama or a film noir. So don't worry, everything works out -- for him and for Ed, whoever he is.